Commandments that had been erected on the grounds of the Arkansas State Capitol less than 24 hours prior. Thirty-two year old Michael Reed deliberately crashed his car into the monument, streaming the action on Facebook Live. The video, linked below, shows him position his Dodge Dart in front of the building, yelling “Freedom!” then accelerating across the lawn straight into the statue. In a video made before the incident, Michael Reed describes his motivation. He first affirms that he is a Christian and believes that everyone should find salvation through Jesus Christ. Despite this, he considers the erection of a monument to a religion to be a violation of the separation of church and state. State Senator Jason Rapert held a press conference shortly after the destruction of the idol. He bemoaned the hatred of Christianity that he says compelled Reed, a Christian, to act. He also announced that a replacement is in the works. If you wander into the comments section of any website covering this story, including this one, you will no doubt see a wide variety of responses to Reed’s actions. You’re likely to see views from vehement anti-Christians cheering for Reed, to those that agree with his sentiments but not his actions, and everything in between. One interesting and somewhat popular response is that of Christians proclaiming that Reed was not a real Christian because of his actions. There is, of course, no designated person who gets to decide who is and who is not a Christian. One can only imagine that this view stems from the notion that all real Christians agree on everything; this is simply not the case on a wide variety of topics. Some, for example, believe the Bible (and thus the Ten Commandments) should play a fundamental role in American civic policy, creating a sort of Christian caliphate, if you will. One such person would be Sen. Rapert, who one day before the incident said, “We have a beautiful Capitol grounds, but we did not have a monument that actually honored the historical moral foundation of law.” This statement implies that no civilization outside of Judeo-Christianity has arrived at conclusions similar to those espoused in the Ten Commandments, such as the notion that murder is wrong. This is plainly false. These arguments online mirror actual legal battles on this very issue. 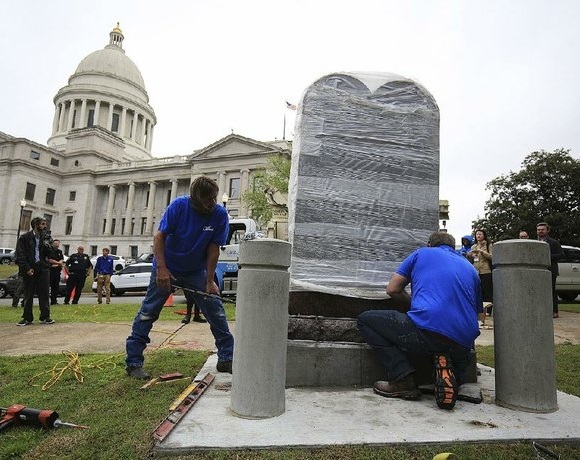 In 2012, Rep. Mike Ritze of Oklahoma had a monument of the Ten Commandments installed on the grounds of the state capitol which sparked a similar controversy. As with the Little Rock case, the structure was privately funded, and thus allowed on public grounds. 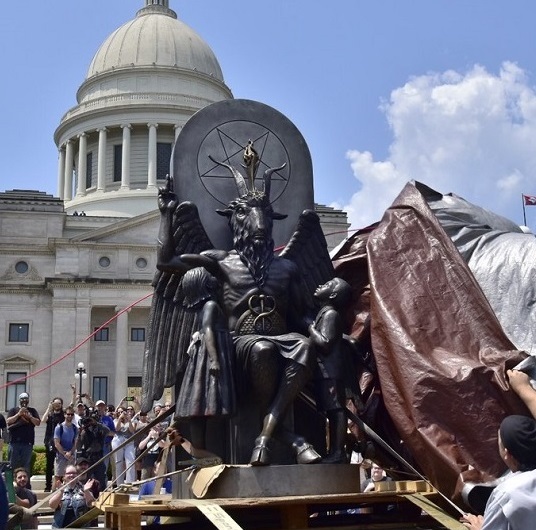 In response to Ritze, the local Satanic Temple decided to donate a monument of a demonic goat figure with children at his feet. Their stated rationale was that they wanted to provide a monument for visitors to compare and contrast with the Christian statue, but it is likely that their aim was at least partially to point out the self-centered absurdity of putting religious iconography in a civic space. The Constitution does not allow for governmental favoritism when it comes to religion; that’s what this country was founded upon. If you can have Christian idols, you must allow Muslim statues, Baha’I monuments, and Satanic structures as well. Given that Arkansas, like Oklahoma, cannot offer special treatment to one religion over another, perhaps Reed could have organized other groups to erect monuments of their respective faiths as a way to protest the perceived focus of the capital on Christianity. That would be a more peaceful way to dissent without having to violently disrespect those that put up the Ten Commandments. In Oklahoma, both monuments ended up being removed since folks would rather take down the Christian statue than allow a Satanic one. Perhaps the same thing would have happened in Arkansas. While Reed champions the separation of church and state, it is worth noting that according to a 2005 Supreme Court decision, statues of the Ten Commandments do not violate the 1st Amendment of the Constitution. But then again, neither does running them over. Its all in the books, where the ten commandments, are not 100% right. He must be a minister try to prove a point to the public. My opinion from visiting the ULC book store. Fun reading. lol. dummy. they are going to pull his drivers license. now he has to walk. I think that it was wrong for any type of religious ornament to be place on governmental property. If they had put it in a public park, that would not be a problem, as long as any other religion is allowed to do the same. However, it was very wrong for him to destroy it. If he wanted to protest its existence, that would be all right. Destroying is not! I guess you will want the 10 commandments removed from the Supreme Court building too. The Commends are important to many religions not just Catholics. Remember Moses was a Jew and so was Jesus! Yes, I would want them removed. Other than stealing and murder none of the Commandments are relative to the SCOTUS mission. The Beatiudes would be more appropriate. I agree that it shouldn’t have been on a government property. Separation of church and state shouldn’t be taken lightly or poopooed away. That it’s been ignored for the last roughly 50 years or so is a travisty to our founding fathers. How come no one said rip to the man who was in this incident. Everyone is just going off on a tangent about all of the events and there personal view about religion. Lord let this man rest in peace and give the family this comforting words at this time of breavement. This guy deserves punishment absolutely. It’s not his place to do this and it’s illegal. I do agree that religious symbols, quotations, and such have no place on government property.It is an absolute slap in the face to the founding fathers. In the case of God references, i believe God is universal. It’s not just a name it’s a common noun used to refer to a Christian god, Buddha, Mohammed. Atheist may have a problem with it, so their opinion should be respected. Ok. So tell me this how do you feel about the us dollar saying in god we trust? Just to reiterate: Christians don’t own the 10 commandments. I believe in separation of church and state but destroying the structure was pathetic. The guy, however had his few moments of fame. these are the kinds of stories that the religious extremist are watching and chatting back and forth to each other saying: man this is a good country. we dont have to tear it down. they are doing it themselves !! wanna go for a hooka ?? Sad that liberal atheists CANNOT HANDLE that this country is Christian and was founded on Christian PRINCIPALS. Seperation of church and state is a LIE created by atheist slave owner THOMAS JEFFERSON. He is a liar and not a patriot. Open a REAL history book and stop watching fake CNN. It’s it a coincidence that so many fundamentalists are illiterate? I wonder about their ability to read the “holy” books they claim as the word of God. It isn’t just Athiests or Liberals. It’s people who know and understand that a clear separation should be maintained. Thomas Jefferson was not the only one in agreement with the idea. Everyone who signed the decleration was in agreement. Many of them wrote letters and articles about why when questioned and it’s been known long before we had CNN. Real history books support the separation. It’s revisionist texts that seem to change those facts. Bernard it is obvious that you are a follower of real news outlets such as Fox outlets or Sinclair stations which give nothing but the unvarnished facts . Perhaps you could explain how the theory of church & state is a lie when it is an accepted fact that has been tested by other narrow minded individuals in the past & has been held up as part of our nations basic principals ? Thomas Jefferson wasn’t a patriot? What? Many of the founding fathers voiced their support of religious freedom and made clear statements about their not wanting the government they were establishing to be a theocracy. lol. ok. you keep telling yourself that. christianity is a european thing… lol brought over by.. umm.. former immigrants. silly. this is what the natives call.. karma. lol. I love you Inga!… Many Blessing to you my North European Sister. This is hilarious. 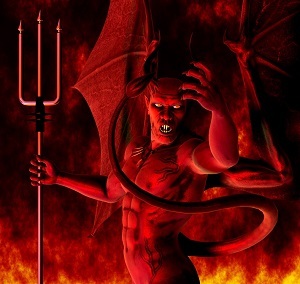 Everyone is angry about this guy breaking the Ten Commandments, yet how many of us have never broken any of the Ten Commandments?… I’d also like to highlight that the Sabbatical Goat is simply a bastardised version of ancient pagan Gods and is truly Satanic, as Satan himself is so a bastardised reinvention of ancient pagan Gods, in depiction at least… The reality is that they exist in their original forms with these new descriptives being grossly misrepresentative of their origins, thanks to the likes of those who wish to perpetuate religious separation and hate doctrine (on both sides eg the hirachy of the catholic church, Crowley etc) in order to publishes their own opinions and causes (money making)… Keep all religious philosophy out of public spaces… Especially as most religious people don’t even know the true origins of their faith. Why are all celebrating the lies that goverments have force fed us in order to manipulate and control the populace, and of course make money of it… And in doing so perpetuate the very same lies that the world is now at war over. There is only one commandment that is neccessarly… LOVE EVERYONE. And thank you Inga, I whole heartedly agree… The natives of all lands call this all Karma, of course I am biased here, being A Saami Shaman and Tribal Elder. Very well said Reverend Alia. the cake of the week is cherry cheese cake, being that cherries are in season and is my son’s birthday coming up and his fav for birthday cake. breaking the 10 commandments.. bahaha. too funny. i will have to pass that one one.. lol..
that guy didnt think it through to welll eh. i dont think they get cherry cheese cake in prison. i was raised by dutch immigrants, but cant follow the western philosophy , any more than they can/could. as it appears to keep changing to suit, which doenst make sense.. lol. well sort of it does, but sometimes i see the changes as convenient.. lol., i meet a lot of dfferent people i like; good people, none of the doctrines make me like them enough to join their religions though. but they still like me because i really do try. seeking the truth is hard sometimes.. lol. but i do respect for people, plants, animals, rocks, and bears.. etc . even if i dont understand. i call it faith. i am not always sure in what. that changes sometimes.. lol. but faith. i need to believe somebody knows what the heck is going on.. lol. until then i just laugh. please disrequard if it comes off inappropriately sometimes. i read this one article once of this guy getting baptized in the sea. the minister dropped him, and the man was lost in the current. i know thats not funny. but i find it hiilarious. I would point out that Moses was the first person said to have smashed the 10 commandments tablet. And God was not happy about his actions. It’s absurd to waste people’s money on excessive Supreme Court trials, but to mow down a ten commandments monument is excessively wasteful. To place that monument on public property is a waste of taxpayer money and should be illegal under the intent of the framers of the constitution. The constitution is clear that we are a secular society and have a wall between church and state. John, it helps to read the whole story. Your taxes were not used to purchase this monument. It was paid for by donations. I love how these very pious people depict the Ten Commandments on stone tablets (supposedly like the ones originally carved by the finger of God on Mt. Sinai) with ROMAN numerals, and from left to right! And they are so keen on honoring the Christian Bible (which version?) but fail to notice that Jesus claimed to be the Christ or Messiah who would fulfill (and thus make it unnecessary for other humans to do so) all the commandments, then abolish the covenant based on them and replace it with a better covenant, the covenant of Grace, which has TWO commandments: Love God with your very being, and love your fellow humans unconditionally. Of course, if you think about it and are familiar with that material in the Bible, you realize the TWO commandments stated by Jesus subsume and cover the TEN. . .
Who should God command? Why would such commandments be required? If he is infinite and he want’s something so badly that he would command it – why is it necessary that he command anyone? If he did issue commandments, would they not automatically be kept as God cannot create imperfectly? What kind of king or ruler would command – and than sit by and watch it not be so? God is neither a king nor a ruler. He is simply the Creator. He does not rule, but merely creates and keeps on creating. He created us, and blessed us in his image and likeness. He made promises and commitments to us. He told us in plain language how it will be when we become as one with him. And he came to Moses, even as he comes to us now – with a divine covenant – an everlasting promise – a sure and certain commitment. The Word of God is not a commandment, but a COVENANT. These then are… ten COMMITMENTS. You shall know you have taken the path to God, and you shall know that you have found god, for there will be signs, indications, changes in you. The ten recommendations he advises, not commands as he cannot command us and take our free will agency away and force us to choose – they are for our benefit, not to benefit god who needs nothing. We are given signs, for he promises that one who truly seeks God shall NO LONGER DO THESE things. It will be impossible to continue such behaviors. These are our freedoms, not our restrictions. They are commitments, not commandments. For God does not order about what God has created – God merely tells God’s children: This is how you will know that you are coming home. If you are taking on the path of godliness, you will no longer covet, murder, steal, or do the things. One with an eye single to the glory of god does not need commanded. They have a self driven choice to commit to follow the steps laid out independently – without coercion or force, manipulation of a “reward vs punishment” scheme. God does not have conditions for his love. He creates, and teaches us the divine laws that simply ARE. If we abide, we will be happy, and progress smoothly. But if we resist, by our own choosing we delay our connection to him. We are not commanded, we are created and free to choose as we please – this is the game of life. Would anyone have a problem with that, do you think? Honestly I’d rather if they are going to post anything it would be things like the constitution and other US guiding document. I honestly beleive we have such conflict over it right now because it’s not visually forward and present in our day to tday lives. Because there is such a separation we should keep the commandments in church yards and homes who practice and live by them. People don’t have to like or live by whatever other religious or lifestyles they don’t agree with of feel is against their own religion… but forcing others to live by them or be punished or banished is rediculous and unnecessary. No religious monument of any type should be displayed on any public grounds. No exceptions. There is a Constitutional seperation of religion and state that trumps any and all religious belief. First, if you’re going to quote the Constitution at least know what it says. The Constitution does not say separation of religion and state, but the separation of church and state. Furthermore our forefathers intended for the separation to keep the states from interfering in the churches and curtail or create rules for churches to comply with. The reason the pilgrims left Britian was due to the British King and Parliament creating rules or laws that restricted their freedom of Religion. I’m in Arkansas our Govnor stated bouldy The Ten Commandments did not come from the Bible our forefathers created the Ten Commandments when they created America . How completely ignorant are his followers ? 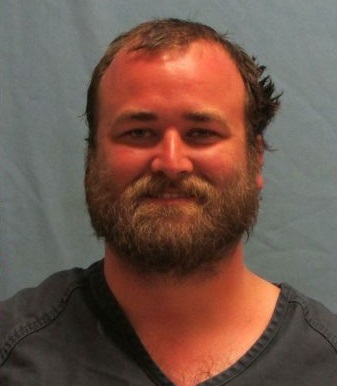 He also avoids the fact Little Rock is ripe with gangs big gangs . Last week 23 people shot in a club he again avoided truth but the police chief stated on the news To attempt to redirect truth denying gangs is a insult on the voters intelegence . As for the 10 commandments they Do Not Belong on State Capitol grounds seperation of church and state , our Govnor is attempting to force State sanctioned religion ignoring all other beliefs . He should be removed from office . He has Dogma buddies whom attack all whom do not support their very thin line of religious dogma . I think it is just sad. this person is full of self and did very self serving act. This has become the norm, that we have become such attention whores. 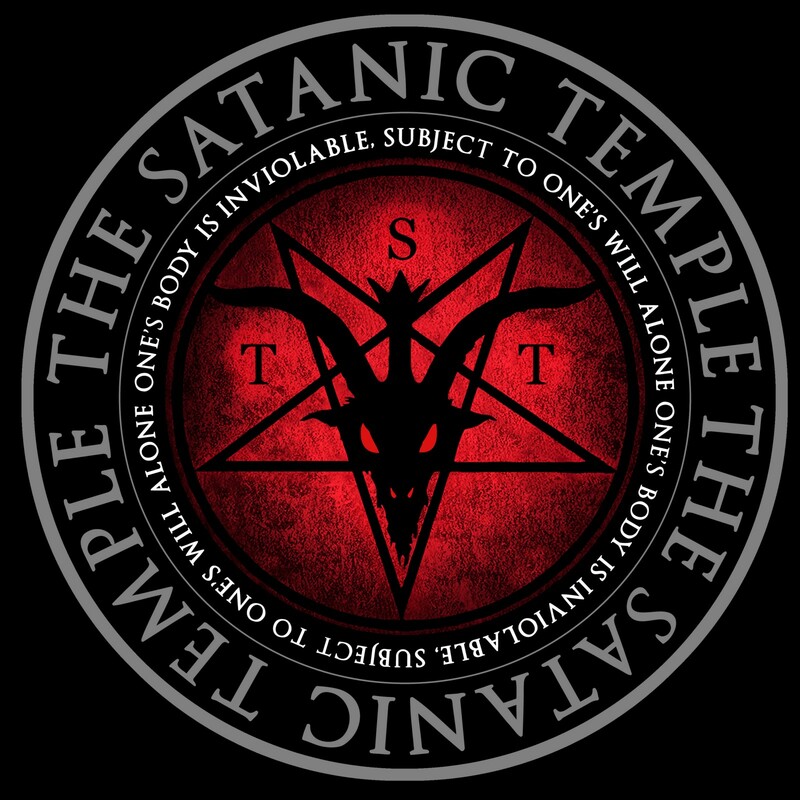 Since it was a Satanic group who funded the Baphomet statue your assumption is correct. This wasn’t an animistic statue it is, indeed, a religious one- and it is Satanic. Isn’t it great that this Country ALL religions are equal? ….or should be? If we allow any entity such as a public park, school, or government building to display monuments to any religion it is as though that entity supports that religion. Religion does not belong in our government and that includes buildings, schools, parks, our money, and our pledge of allegiance. Indeed. It does you have many religious faiths and organizations that support and contribute to the building fund. You also have goverment funding that supports this as well. Most churches are not owned compleatly by anyone which is why you sometimes see forclosures and things like that. I believe that religion has a time and place every where. One has to be able to desern what one wants to use as the barometer to govern their lives. Which ever faith is selected. To say that religion should not be at the very least introduced is the at the discression and business of the founder. This is the person who has a focal point for how they envision there school to be and what teachings will be available to the students their. With reguards to other places such as parks it could be a community effort to decide if they would like it to be a religion associated since it is after all a place open to the public. One may want to consider joining a community board where they disuss more in depth how to approach the community enviornment or structure. Since I voted in the last POTUS election should I not have the right to also but up a statue who I think should be honor in front of a public building. Another time-waster of a story. The guy that ran over the monument is an idiot. Charge him with the crimes he committed and be done with him. As far as the monuments go, I could care less. If the people that live in Arkansas don’t like the monuments, they can complain to their state officials. If they don’t get what they want, vote for somebody else. That’s it. End of drama. Don’t make more out of it than it really is. Now, get back to stuff that really matters. 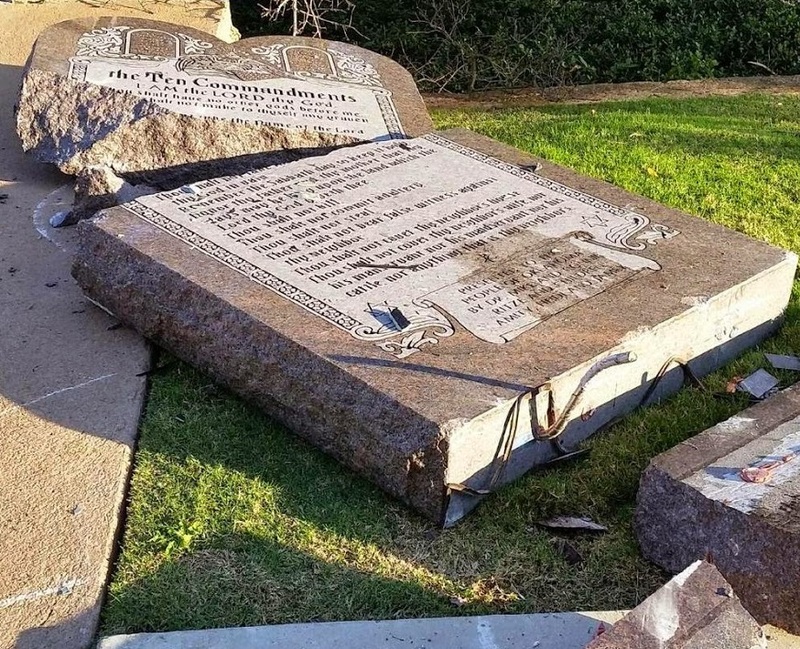 Anyone who destroys or defaces a Christian monument should be locked up for a very long time! Hey, Reverend. How do you feel about the defacing of Jewish monuments? Or Muslim, Hindu or Buddhist monuments? How do you feel, Reverend, about anything that isn’t important to you but may be important to others? Think carefully before you answer. God is watching. Seems like with that idea you could destroy the 11th, thereby nullifying it, which means you could then destroy the 10. The ten commandments and anything religious should be removed from anything government. And don’t start whining at me Christians or Catholics You don’t follow them or you would not walk into 90% of your churches. What this man did in destroying someone else property was wrong but was it illegal as the item in question was on property illegally. But this same kind of entitled moron would turn around and claim ideology such as the Nazism and Islamism are religions and not abominations to free thought and equal rights. I look at it this way. he decided to destroy something that was causing no hard because it offended him. In the states he has the right to be offended and say anything he likes about it, But he has no right to talk away the other persons right to offended him. We need to start killing off this kind of thought that leads to this action. A good start would be wiping out rioting protesters. stop coddling them just shoot them or put the crazy fucks away. When I see a monument on public ground, my usual question is who paid for it and who takes care of it. I have the 10 Commandments on the wall at home. It’s in my home. I’m not for or against public religious monuments, of any religion. I don’t want tax money to pay for them. I do agree that some of our laws were based on the concepts of the ten commandments. Said commandments are, after all, a great moral compass and should form the basis of law. Still they are not the oldest form of law and certainly not the only consideration our founding fathers used when forming the beginnings of our codified laws. A private group does have the right to display their pride in their religion on public grounds so long as every private group has the same right to do so- bravo Oklahoma. I do not support Michael Reed for taking the actions he did. In doing so he undermined his own objections to the monument and circumvented the law. He had every right to object loudly and to begin a movement to amend or remove the monument but he did not have the right to destroy said monument. I am not Christian and I do not believe that this Nation is a Christian Nation, but I do believe that everyone who lives in this Great Nation has the right to put up monuments so long as the government is not footing the bill- and those monuments should be respected or removed by democratic decision not by vandals. I share his frustration, but he reduced a very supportable argument to an act of vandalism. Secularism is for grownups and it helps if secularists act that way. Religion belong in churches only. Take it all out of public places. Otherwise we wind up with a religious tyranny much like in Iran. Religious people think nothing of this tyranny since they are blinded by their beliefs thinking they do this for their god. Republicans are running down this path of tyranny and they think they do it for their god. While I do agree with the separation of church & state, vandalism & violence are not acceptable. Ok. I feel like this is an oxy moron. How can you separate the church and the state. These doctrine were instituted to provide our government with a means to govern our behavior. Thus you will find that there may be less crime to begin with. Private donations? Fine, make him pay them back!! Secularism is for grownups, but Reed’s action was beyond childish.